Drone regulations and links for people flying drones in Aruba. According to Aruba’s national aviation authority, the Department of Civil Aviation Aruba (DCAA), flying a drone is legal in Aruba, but we recommend being aware of and compliant with the drone regulations listed below before doing so. If you’d like to contact DCAA directly before you travel with any questions you might have, contact Willem Vrolijk at telephone 5232665 ext. 677, e-mail: willem.vrolijk@dca.gov.aw or Anthony Kirchner at telephone 5232665 ext. 672, e-mail: anthony.kirchner@dca.gov.aw. Based on our research and interpretation of the laws, here are the most important rules to know for flying a drone in Aruba. Drones cannot fly higher than 200 feet unless permission has been granted to the operator from the DCAA. The drone operator must maintain visual line of sight (VLOS) when operating a drone. When utilizing the “First Person View (FPV) technology, a second person shall act as an observer. Never operate in Prohibited or Restricted Areas, especially near the airport (not within 4 kilometers). Never operate in the vicinity of aircraft, over groups (accumulation) of people, stadiums or sports events. Never operate near emergency response efforts such as fires, accidents etc. Never operate under the influence of alcohol or drugs. Never operate your drone in such a way, that could endanger people or property. Never operate your drone in rainy or stormy weather or in extremely low visibility. Never operate your drone at night. Never fly over private property and/or breaches protected by privacy laws. Only drones operating in the frequencies 2.4 and 5.8 GHz are permitted to operate in Aruba. The drone operator (or company) is legally responsible for the safe conduct of each flight and is strongly encouraged to acquire insurance. For more information on Aruba’s drone laws, visit the DCAA’s website. Know something we don’t about drone laws in Aruba? Send us an email at support[at]uavcoach[dot]com. We are not international aviation attorneys and do our best to keep this page up-to-date for drone pilots, but the reality is that given the pace of the small unmanned aerial system (sUAS) industry and how governments are responding, drone regulations in Aruba can change throughout the year, and those changes can be hard to track. If we missed something, please reach out to let us know. 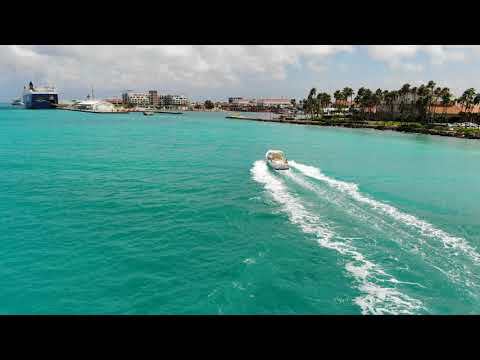 Aruba Drone Video - Turn on 4K! !